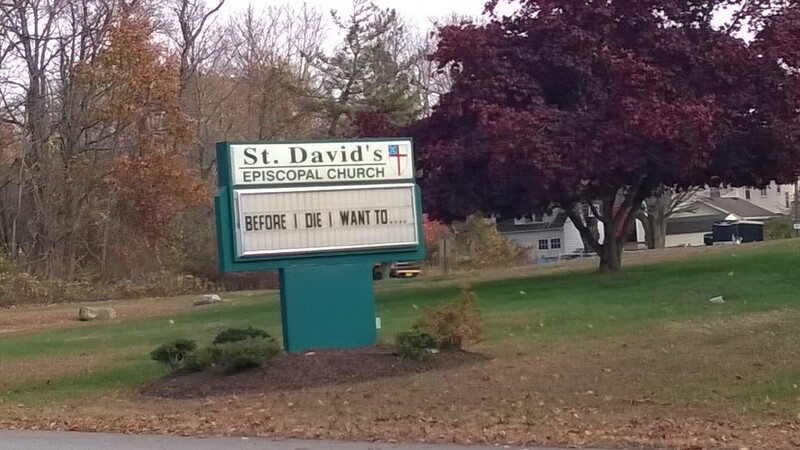 On Sunday, my 7th “cancerversary,” the celebration of seven years in remission from an aggressive form of lymphoma, I saw this sign in front of a local church. If you actually start making that bucket list, you are probably not near death. If your list includes soul-searching, “Eat, Pray, Love”-style trips to exotic lands or anything involving a helicopter or a bungee, you likely haven’t truly been forced to consider death at all. What to pack for Rome, perhaps, but not what to leave behind as your legacy. I know this, because I have in fact answered the question, in pleading prayers, tears streaming down my face, swallowing sobs so I don’t wake up anyone in the house. That’s it. What else can there be to want when you have cancer and kids? When at 8 and 10, your kids are smack in the middle of childhood. When you were supposed to be taking the kids to their piano lessons and instead, wound up in the hospital having a core needle biopsy, which involved injecting a needle into the six-inch tumor in my left lung. When you find out that the cough and flattening fatigue you had was caused by a cancer that grows so fast, it’ll kill you in under a year. And I was about two months from death. “You have lymphoma,” the doctor reported. Before I die, I want to…see my kids grow up. My answer was a luxury that came with a curable cancer–and the kind of chemo that makes your hair fall out, and scattershot radiation that puts you at risk for other cancers down the road, but saves your life now. I had a shot at survival, when so many other parents don’t. These parents have the incurable cancers, the recurring cancers, the stage 4 with metastases cancers. They can’t let themselves want to see their kids grow up, because the odds are slim. Or none. Instead, their pleading prayers are about feeling healthy enough to go to a kiddie soccer game, or to see their babies walk, or to see their teenagers graduate from middle school. Their bucket lists are full of the stuff that healthy parents take for granted. I was there, and now I’m not. I measured my life in PET scans, three months at a time, for two years until I was considered cured. Now seven years in remission, with death not quite so darn close, what do I want? I want to see my kids grow up. When you’ve had cancer and kids, what else is there?